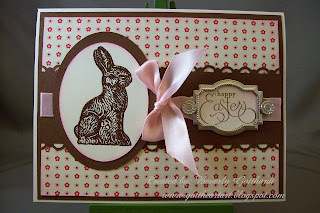 As soon as I saw this sketch at The Pink Elephant Challenge I knew I had to use my new stuff from Stampin Up , it just screamed Chocolate Bunny. I don't think you can tell it very well, but I used Zing! Embossing Powder Brownie to emboss the bunny, he feels very chocolatty. I found this cute little poem to go with it, so , if it doesn't make you giggle, I know it will make you smile. Supplies: Ivory Card Blank 5" X 6 1/2" think hot hues, Papers: Stampin Up-Sending Love Specialty Designer Series Paper, chocolate chip, pink textured card stock unknown, Stamps: Stampin Up-Chocolate Bunny, Well Scripted, Ink: Stampin Up-Pink Pirouette, Ranger Archival Ink:Coffee, VersaMark Ink Pad, Zing! 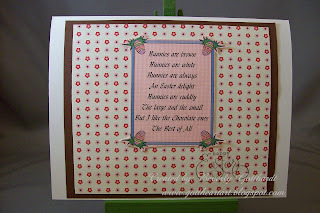 Embossing Powder-Brownie, Fiskars Shaper Cutter Template-Ovals 1, ribbon-Offray, Stampin Up-Designer Label punch, Scallop Trim punch, Stampin Up-Hodgepodge Hardware, sentiment inside generated in Printmaster 11. This is just gorgeous Beverly - love how you have used our Pink Elephant sketch. PS - you may want to pop over to Bah! Humbug! - a surprise awaits you! WOW! I love the chocolate bunny done this way (he's on my shopping list for sure now LOL)...and you are right, the poem is great!